Community Connect is here to help make the process of booking our services easy. If you have not yet used our services, you will need to review the eligibility requirements. If you have any queries, or require further information, please don’t hesitate to contact us via email info@communityconnect.org.au or phone on 9490 9500. If the phone is unattended please leave a message. Bookings can be made via email info@communityconnect.org.au or by contacting our Transport Co-ordinator on 9490 9500. If the phone is unattended please leave a message. To help avoid disappointment it is best to book more than 2 days advance whenever possible. If transport is available you will be asked to be ready to be picked up at least half an hour before your scheduled collection time. The driver will call you up approximately half an hour before you are due to be picked up to confirm your booking and to confirm what time you will be picked up. Other passengers may be travelling with you. If this is the case, the driver will advise you when they call you. The driver will take you to your destination and on arrival will give either your or the receptionist a card with a number to call when you are ready to be taken home. You may have to wait a while for your return trip as getting people to appointments has priority over taking people home. When you call for the return trip, the driver will be able to give you an appropriate time of when they will be there. Please note: All vehicles are smoke free zones. You are asked to refrain from smoking until you reach your destination. Seatbelts must be worn by all passengers in all our vehicles. If you are not able to make your appointment please let our Transport Co-ordinator know as soon as possible. Please phone on 9490 9500. If the phone is unattended please leave a message. The Community Connect Transport Service operates Monday to Friday between the hours of 8:00am and 4:00pm. This means that the earliest we can pick up for an appointment is 8:00am and the latest we can pick you up for a return trip is 3:30pm. When you start using the service you will be asked to supply personal information which is necessary to ensure we provide safe, appropriate service. This information is kept secure in the office and only accessed by authorised staff. Some information we request is also gathered on behalf of our funding body. This information is used for planning for future services. This information is sent in a way that makes individual passengers unidentifiable and is confidential. If you prefer not to have this information sent to our funders, please advise us. Choosing not to have your information sent to the funders has no effect on the service you receive from Community Connect Transport. We are here to help you with your transport needs. To discuss your specific requirements or if you have any questions please contact us. A member of our Community Connect family looks forward to assisting you. By providing professional, safe, reliable, and courteous transport services, Community Connect enables people living in their own homes to access services and community facilities, so that they can maintain their health, wellbeing and independence. 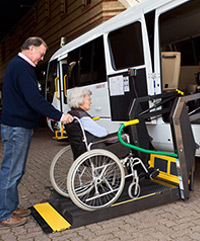 Community Connect provides transport services for medical appointments, as well as shopping and social outings, for those who have difficulty catching mainstream public transport. It is a service we have proudly provided since 1993, under the name of Lower North Shore Community Transport.